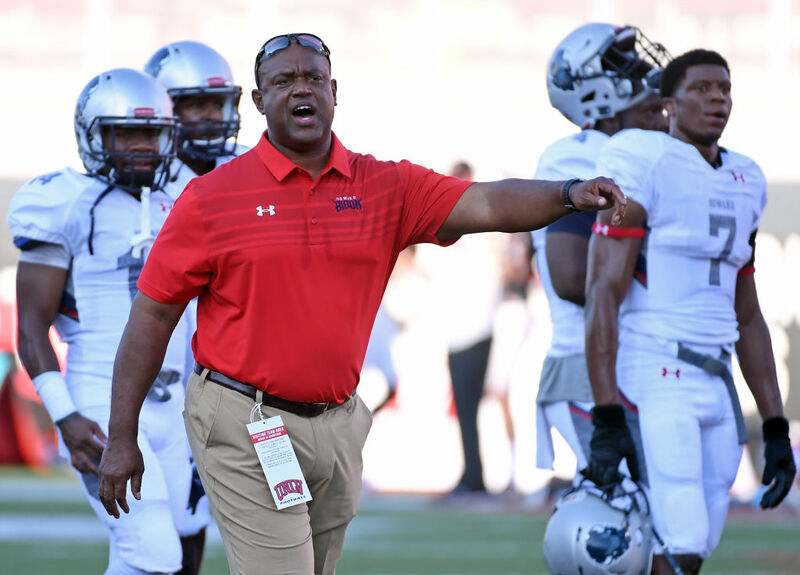 After two seasons London appears set to leave D.C.
After just two years at Howard, Mike London will be named the new head coach at William & Mary according to a report by ESPN. London would replace Jimmye Laycock who retired at the end of the season after 39 years on the job. London worked as the defensive line coach under Laycock at William & Mary from 1991-1994. London is obviously a well-known coach in the state of Virginia where he was the head coach at the University of Virginia and the University of Richmond. London won an FCS National Championship at Richmond in 2008. Since the initial publication of this article, London acknowledged the move on his official Twitter account Monday afternoon. There’s no denying, however, that London along with quarterback Caylin Newton brought excitement back to the Howard program. The Bison were still in contention for a MEAC Championship before a loss against Norfolk State last weekend. The news was first reported by footballscoop.com . Is this the best candidate available?? I wish Coach London the best. A Coach should be where his heart is. Whether that be Rice University or William and Mary or an HBCU. These decisions define their legacy and amplify their priorities. I hope that this reported move takes London closer to the true work and calling of his life. It’s a new take for me but when I think about it part of the Great Coaches secret sauce. Guys like Robinson, Gaither built legendary careers because they were chasing their version of greatness. London should do the same at the place that he believes the impact will matter MOST. It’s a new perspective for me but it just seems to ring true when I reflect upon life. I salute Coach London for the time he committed and the work he did. He helped add to MEAC lore with the work his team put in at UNLV. My heart goes out to Howard University and the MEAC but we will weather this too and be better because of it. Thank you for bring this to the “Barber Shop” committee’s attention. LOL! Be great today. This is one of the reasons I probably would not have hired him. This guy is not true to HBCUs. You can tell. This guy probably wouldn’t want his son to go to Howard if it was free. I wish him well but you could tell from the beginning his heart was not at Howard. Also he is a mediocre coach at best. He won with a Richmond team that made it to the championship game the year before under a different coach. I hope Howard finds a long term coach. Sell out , MEAC make the buyout bigger . Is Mike London preparing for his Howard exit after just two years?